For Immediate Release: Posted On 12/8/2015 By Industrial Magnetics, Inc.
Industrial Magnetics, Inc.’s Suspended Permanent Magnets(SPMC’s) are an economical magnetic separation solution for over the conveyor/cross-belt applications and now offer new cleaning options for the easy removal of collected metal from the magnet face. Featuring a powerful, permanent magnetic circuit that pulls metal contaminants out of a product flow, SPMC’s are used to protect vital downstream processing equipment from costly metal damage and to improve product purity. They are proven in industries such as, Mining, Aggregate, Recycling, Tire-shredding, Foundry, Wood Chip, Pulp & Paper, Power Generation and Construction & Demolition. 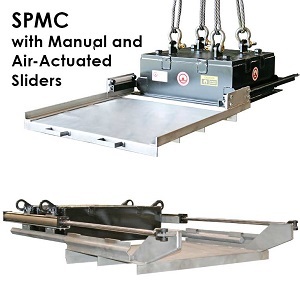 Featuring a low-profile design and a uniform, extended magnetic field that reaches across the full width of the conveyor, the SPMC is ideal for portable size-reduction equipment or stationed prior to a metal detector to achieve maximum separation and system performance. IMI’s new manual, hand-crank or air-actuated slider plate options offer a quick and easy method for regular removal of collected metal from the magnet. When active in the application, the plate acts as a skin over the face of the magnet and attracted tramp metal is held securely in place by the magnetic field. During cleaning mode, as the plate is moved outside of the magnetic field, the metal contaminants are released and fall into a catch bin for disposal. For additional information, please contact Industrial Magnetics, Inc. at 231.582.3100.